As you may know by now, I’m the queen of secrets when it comes to afternoon tea and all things related to this great British pastime. Well, if you share the same passions as myself, you may or may not have heard of The Secret Tea Society…. I’m a member myself and this is a club worthy of a mention, having finally been to my first ever Secret Tea Society meet up since joining in December 2013. And oh boy, this was an afternoon tea to remember! Firstly, if you don’t know what this Secret Tea Society is all about, well, you’re not really too clever in my honest opinion! This is like Fight Club, but without the fisticuffs… I hope! 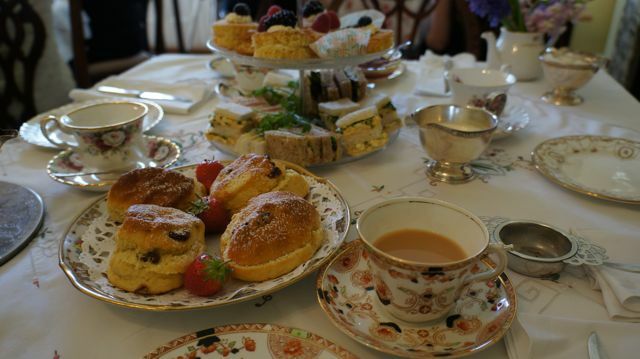 Swap the underground bare-knuckle fighting for afternoon tea in lovely secret venues and you’ve got the picture. Created by the very lovely Claire Worrell, you can join The Secret Tea Society for a modest fee (you can opt for a pretty trio of china and loose leaf tea to arrive as one option), she has created a network of tea loving ladies who may first ask you to do a little dance and sing a song, but will welcome you into the fold if you adore these traditions as much as she does. You can join this members only club at any time and there are many different themed events of varying costs (sometimes free) throughout the year, which allows you to pick and choose the ones that sound right for you. As a Cambridge girl, I was concerned that I’d be travelling a lot to head down to these events, but Claire is open to suggestions for events further afield, so who knows, I may have an idea or two up my sleeve to help her out. I was even suggesting the club to a friend of mine a few months back, Cat of The Teatime Treatery and bizarrely, she had also just joined and had booked her very first event on the same day as my own first visit… It’s a very small world! And this truly wasn’t just any old afternoon tea event, this was a very special day indeed, one that Cat and I spent a lot of time building up to, bubbling with excitement and nervous energy equally. This was an event to mark the first birthday of The Secret Tea Society and there was only one theme to mark this special occasion…. This was to be a 1920’s inspired afternoon tea, with a suggested 1920’s wardrobe to match. 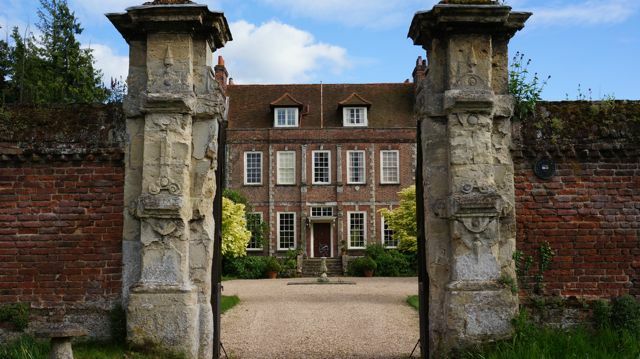 Not only that, but this was to be hosted at Byfleet Manor in Surrey, better known to fellow Downton geeks as “The Dowagers’ House” where the mother of Lord Grantham (Dame Maggie Smith) lives in this hit TV show. This was truly an honour, as Byfleet Manor is a private residence, not usually open to the general public, so a very lucky group of tea enthusiasts we were! The guests made a terrific effort to dress up, with a mix of colour, beads & pearls, stunning hair styles, dresses and heels, the house was buzzing with excitement as we took our welcome cocktails to the tea lounge overlooking the picturesque gardens to sit down for a few hours whilst getting to know some new friends. Each place setting had a stamped envelope with a pack of loose leaf tea and a stunning hand decorated biscuit for everybody to take home with them, such a beautifully made teapot shaped biscuit, I ALMOST didn’t want to eat it! 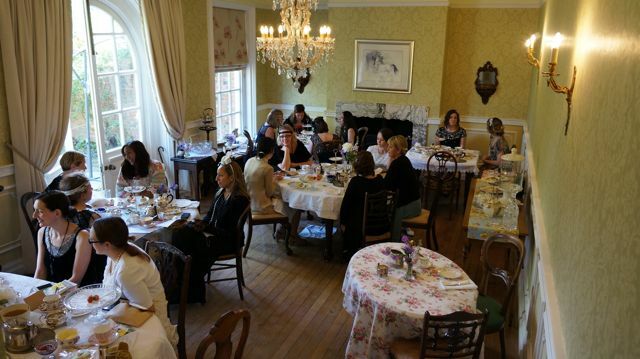 The afternoon tea was served by staff dressed in black and white outfits, the butler in a smart black suit and the waitress in a full maids outfit, they looked fantastic and knew their loose leaf tea, much to our delight. They even posed for photos with some of us sat in the world famous “Dowagers’ chair” later on, we really were nerds! The china was matching and the small silver butter knives were stunning, with ornate handles and shining beautifully in the sunshine. Because this was a family home, owned by the lovely Julie Hutton and her family, there were animals walking around the house and the garden. Her gorgeous 8 month old Great Dane was standing on the patio looking in, drooling over our feast and her many cats, dogs and even pigs in the furthest end of the grounds entertained us as we explored. What was lovely about this sunny afternoon was the fact that we were invited to make Byfleet Manor our home for the duration, we were allowed to wander around, use the bathroom (many members wanted to take their stunning copper bathtub home with them, myself included!) and we couldn’t leave without looking around their little room of vintage treasures, where many items could be bought and taken home. All of this, the shop full of vintage china and trinkets (as well as some Downton Abbey paraphernalia) the afternoon tea in the conservatory and the fantastic hosts offering their stories and fun as a huge part of this period drama was suggested as an offering to tourists after people (mainly American fans visiting the UK for a Downton-themed tour!) wanted to visit this iconic home and see it for themselves. Whilst getting to know Julie over a cuppa, she advised how she allowed one fan and her daughter to visit for a look around, offering them some afternoon tea delights (she truly is the perfect host!) as they had been so respectful and excited to be there. 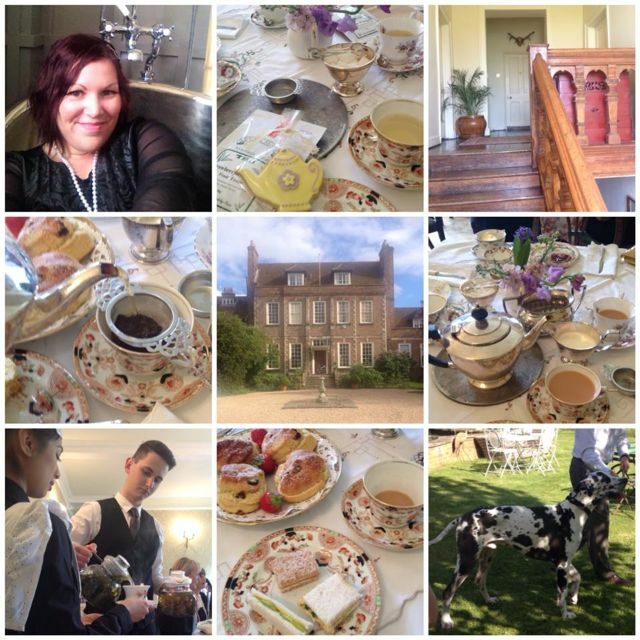 From this visit, the idea developed to allow others to come along for this experience… and so the afternoon tea venue we enjoyed on this day had been created and a warm welcome allows fans to get close and personal to their favourite Downton character. The afternoon tea itself was homemade by Julie and it kept coming, there was so much, we were full to the rafters by the end. The crustless finger sandwiches offered a selection of fillings, including cucumber, a spiced chicken, egg mayonnaise & cress (this was delicious and dangerously moreish!) and smoked salmon. These were the perfect size, two bites per sandwich, which allowed us to sample them all fairly easily…it would have been rude not to! The large fruit scones were served warm with strawberry jam and clotted cream and were served with fresh strawberries to add colour and fresh flavour to proceedings, I loved them! There were so many cakes, we really didn’t know where to start – Cat and I were in cakey heaven! Light vanilla sponges with fresh cream and blackberries, some sponges with lemon curd and cream, small petit fours including pastry cases filled with toffee and vanilla creme patisserie and fresh strawberries, it was a sweet-toothed paradise. She had also made tiny bite-sized chocolate brownies, gooey in the middle and my favourite treat by far, they melted in your mouth and I couldn’t get enough – I would have done the Dowager proud as her guest! If this wasn’t enough, we were also served a chilled trifle shot in a small glass, complete with jelly and topped with a fresh mint leaf, it was the perfect size and came with a tiny silver spoon that oozed cuteness. Yes I did just say that, apologies, but it WAS super cute. I do love jelly in my trifle, it reminds me of the way my mum and great auntie always makes/made their trifles, it really isn’t the same without some raspberry jelly in the centre, much to controversy! This was an amazing day, finished off with a guided walk by one of our hosts through their garden (heels and damp grass making for an interesting combination!) 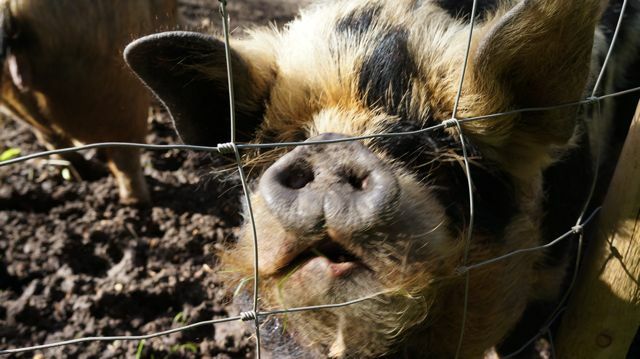 and a quick visit to their friendly & furry pigs before driving home, what a day! A huge thank you to Claire for arranging such a superb experience and to Julie and her wonderful team for allowing us to descend and take over Byfleet Manor for the afternoon! In fact, Julie mentioned to us before we made our way that she will be hosting a grisly “murder mystery” afternoon tea in the summer with a couple who have actually worked in CSI, so expect finger print examinations, a dead body on the floor and an adult only afternoon with a difference. 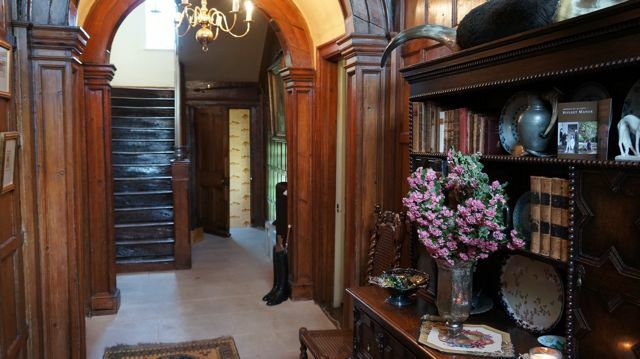 My money is on it being Lord Grantham, with the candelabra in the Drawing Room! 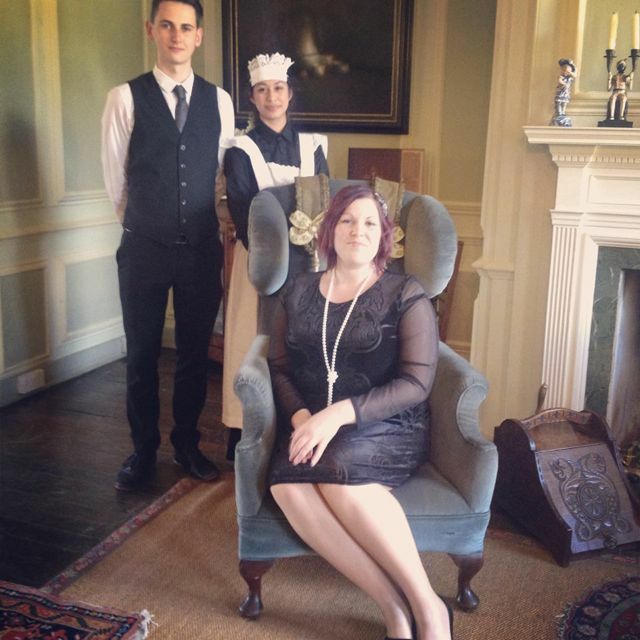 For my full photo album from this Downton Abbey themed event, please click here. I have just received word that my tea reservation at Byfleet Manor on May 25, 2015, has been cancelled. What a great disappointment. I am traveling from the USA to be a part of this event and now it is no longer happening? 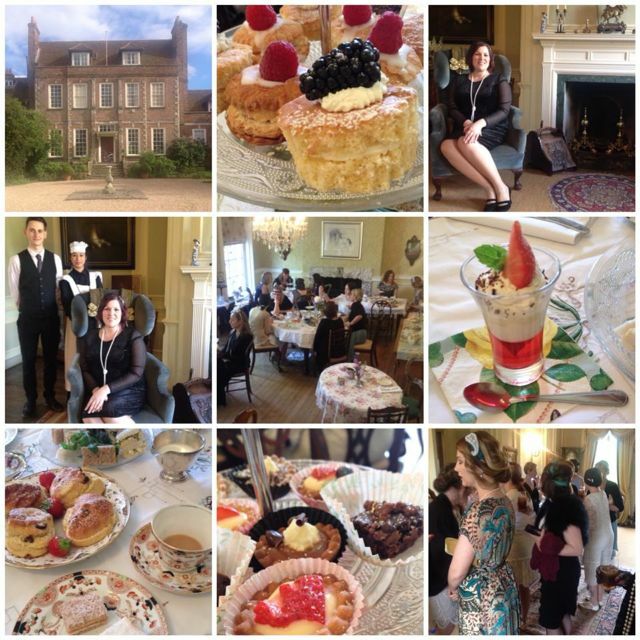 Hopefully you have some suggestion as where I can go to enjoy a true English tea party that isn’t far from Byfleet. I will eagerly await some suggestions. Hi there is always a lovely afternoon Tea at Betty’s of York England , downside is you might have to queue in the peak season, I think they have opened up another Afternoon Tea place, best to check the Website out.